When we last left off, Tianyu and I were ascending to the summit of the Peak of the Staff (Bo-no-Mine, 棒の嶺) on 7th and final section of the Tokyo portion of the Fureai Trail — the Mountain Grass Path. At the top, we found a wide, flat field of mountain grass (possibly the namesake of the path) and a sweeping view into the valleys of Saitama Prefecture’s Hannô City. With a small pavilion, a great view, and a nice shady cherry tree to liven up the spring season, it was indeed as the pamphlet indicated: a perfect place to have lunch. If we were to have continued on to the end of the path, we would have descended down the back side of the mountain to 100 Eaves Teahouse in Upper Sunward village (Kami-Hinata, 上日向) and from there taken the nearest train station. However, our plans were different. The Headwaters Path, unlike the other sections I’ve hiked so far, doesn’t continue onward from the end of the last section but instead backtracks along the previous section back to Gonjiri Pass, which we had just ascended from, and from there goes down into Saitama Prefecture. Typically I’m against hiking the same section of trail twice since every minute I spend re-hiking a section of trail is another section I’ll never have the time to hike, so for that reason alone I was inclined to not hike out all of Tokyo Section 7. In the end, although I did want to hike down that last section, I decided it was best to cut that overlapping section off and go straight onwards, combining the two sections into one. Tianyu and I finished our picture taking and set off back the way we came. 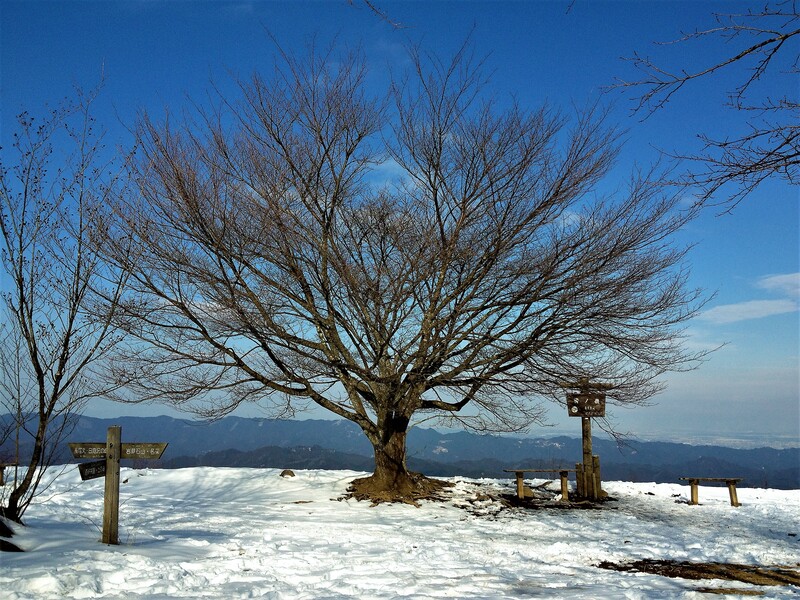 The Headwaters Path gets its name from the fact that both ends of the trail start at the headwaters of a river: on one side, the Otanba (大丹波) and on the other the Arima (有間). We never got to see the Otanba, though I did read in the brochure that it’s a nice place for some summer fun with camping and fishing, not to mention the 100 Eaves Teahouse for refreshment. We did, however, get our fill the Arima headwaters since a significant portion of the path runs through Whitevalley Gorge (Shiratani-zawa, 白谷沢), a deep and narrow canyon on the Saitama side of the ridge. The path down to the gorge from Gonjiri Pass is initially quite steep, but levels out after a fork in the path near a big boulder. Be careful to turn left at that point as the straight path bypasses the gorge entirely. Seeing as we were hiking in January, this advice might have been good to heed. Shortly after crossing the forest road we entered the gorge, with high rock walls rising up on either side of us as we followed a gradually growing stream. The path through the valley was mostly stone and crossed back and forth from one side of the stream to the other. This deep canyon on the north face of the ridge clearly rarely got direct sunlight even in the summer, and the result for us in midwinter was beautiful and oddly shaped ice formations on the walls and waterfalls, and more dangerous ones covering most of the path. Tianyu goes down slippery rocks. Though I think the sign exaggerated the danger, there was indeed quite a risk of slipping, but we managed through without incident. Before long, the rock walls fell away and we found ourselves exiting the forest on a paved road running along the edge of a small body of water: we had reached reservoir behind Arima Dam. If you visit this area in the June or July, you might hear the singing voices of frogs filling the air near the Otanba River or along the stream in Whitevalley Gorge. If you do, it’s likely that you’re hearing the calls of male riverdeer frogs (kajika kaeru), a species unique to Japan. Found in mountain streams all over Honshu, Kyushu, and Shikoku, these frogs have pale brown or grey bodies ranging from 7.5 cm long (females) to 4.5 cm long (males). They have flat aerodynamic bodies and suckers on their feet to help them hold on to rocks in the fast-running waters of mountain streams, so look there if you’re trying to spot one. In addition, if you happen to be hiking in June or July, you might also find clumps of their eggs in still pools in the streams, or from August on you can look for their tadpoles, which fix themselves to small stones so they don’t get swept downstream. Tianyu and I unfortunately didn’t get to see any since they were all hibernating through the winter, but I’m looking forward to keeping an eye out for more as the weather warms up in the coming months. If botany is more your thing, perhaps you’d be more interested in checking out the iroha kaede, better known in English as the Japanese maple. Known for its exceptionally bright red leaves in the fall, this variety is famous not just in Japan but also around the world — even my own grandfather had one growing in his garden and a clipping from that tree is alive and well in my brother’s yard today. The iroha kaede can be found more or less everywhere in Japan, but is particularly common throughout Saitama Prefecture’s mountain regions and is also often grown in gardens. From about April to May flowers tinged dark-red appear on the tips of new branches, and later the characteristic winged seeds develop from them. Though most maples produce beautiful colors in the fall, the iroha kaeda are particularly beautiful, so in Japan they are often simply called momiji, the Japanese word referring to the colorful leaves of autumn. Once you reach the reservoir at Arima Dam, it’s a fifteen- or twenty-minute walk down the road to the bus stop in the village below, but don’t be fooled! There are still a few more things to check out along the way. The first is, of course, the dam itself, which is notable for it’s tunnel-style spillway — the first of it’s kind in Japan. From the top, you can get a decent view of the valley below. Just down from the dam you’ll also see a large parking lot on the right. Aside from being able to catch the bus from here, there’s also restrooms, a small food court (closed in the winter) and a nearby hot spring to rinse yourself off and relax after a nice hike. But those aren’t the most interesting points, as there’s a nice bit of history and legend attached to this area. First, the legend. If you look on your left as you go down the road, you’ll at some point see a small temple up a flight of stairs. This is the Ryûsenji (竜泉寺) or Dragon Spring Temple (that’s “spring” in the sense of a place where water comes out of the ground, not the season). This temple has a fairly long history though the building you see isn’t the original. A member of the Sôtô School (曹洞宗) of Zen Buddhism, Gyokurin Osho (玉林和尚), established the temple in the latter half of the 15th century, though the the stone foundation of the present temple was built by Kyoshu Osho (御州和尚) in the early Edo Period, that being in the 17th century. Though the signboard doesn’t note any greater detail, we can infer that the temple buildings were probably destroyed at least once in the intervening period, leaving behind only the foundation. According to legend, long ago an evil dragon lived at the Ryûonji (竜穏寺) or Dragon Calm Temple in Ogose Village (越生郷), a few tens of kilometers away from the Dragon Spring Temple as the crow flies. This dragon is said to have gotten his tail cut off by Sir Fudo (不動様, the Immoveable) of High Mountain (Takayama, 高山), and afterwards fled to the pond of Dragon Spring Temple at Benevolent Cloud Mountain (Toku-un-san, 徳雲山). After that, the dragon took to living in the deep inner pools of the Arima River (有間川) and began helping the local farmers, becoming a dragon god who makes blessed rains fall after long droughts. They say that thereafter the Dragon Spring Temple became bustling with people who wanted to receive talismans containing the water of the pool and the mark of the dragon king’s spirit. Maybe you can still get them today; I didn’t check. If legends are less your thing and you’re instead more interested in tangible history, you wouldn’t be disappointed. As you wait for the bus after this hike, look around you at the village. What do you see? It’s not so different from small towns in any country, if you ignore the differences in architecture, that is. All around you, you see a collection of buildings that have seen better days, the clear signs of aged like stained facades and rusted metal that speak to the lack of economic vibrancy common to any place on the periphery of society. It doesn’t at all look like a place where anything of importance ever happened. But if you thought that, you’d be wrong: just a bare 200 years before, this very village was the epicenter of an uprising that, among other factors, helped lead to the downfall of the ruling regime of Japan at the time. Japan in the early 1800s was still operating under a form of feudalism, with a single great general, or shogun, controlling a loose hegemony of lords, known as daimyo. This system, having been in effect for a little over three hundred years at the time, was starting to suffer from the kinds of bloat and inefficiency that is common to such long-standing systems, and in particular there were a series of policies that were grinding the lower classes into increasing poverty, among them requirements to tithe the Buddhist religious establishment, oppressive debt and land laws, as well as the forced selling of rice at lower than market price. These resentments boiled over on June 13th of the second year of the reign of Emperor Keio (慶応, 1866). Starting in this very place, Upper Famous-Chestnut Village (上名栗村), the masses rose up, tearing down the houses of the wealthy farmers and merchants who they saw as the benefactors of their oppression. In the blink of an eye the uprising spread all over the Kanto Plain. Though it took a only a bare seven days to suppress, a total of 202 villages suffered damage in that short period, and they say that around 100,000 people participated. In the end it was the largest uprising that occurred so close to Tokyo and it gave such a shock to the feudal system that Japanese historians sometimes cite it as the first domino to fall in the chain of events that led to the collapse of the regime. The trip finished, catch the bus back to Hanno, and from there the train to Tokyo. That’s the end of the first Saitama section of the Fureai Trail. Stay tuned for next week’s post, where we delve deeper in the history and legend of the area as we explore a series of temples along Section II of the Saitama’s Fureai Trail: The Path that Visits Inner Musashi’s Historic Temples.